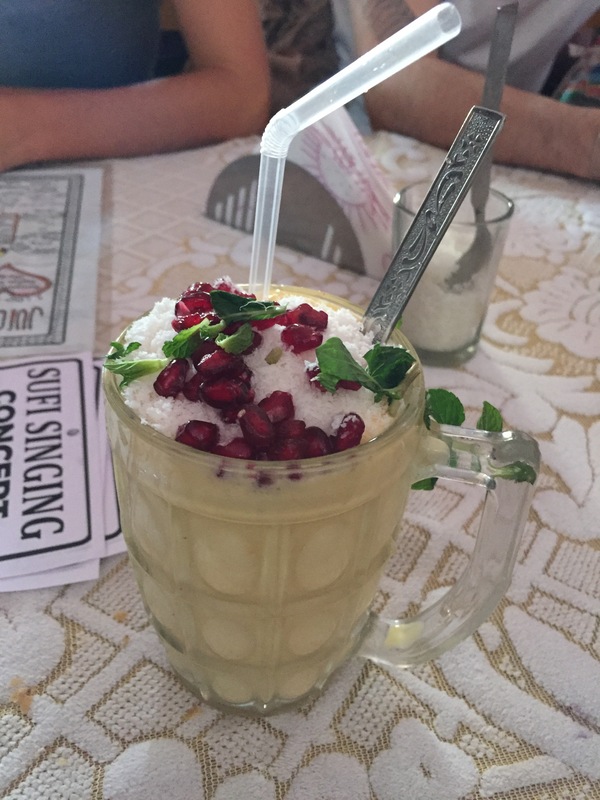 One of my favorite juice places in all of India has to be the popular Juice House in Ram Jhula, Rishikesh. 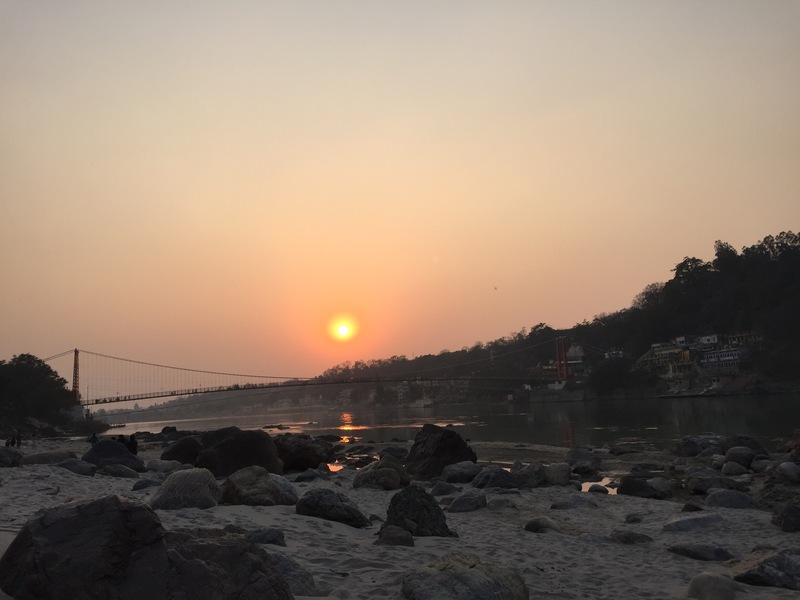 The city is situated on the foothills of the Himalayas and along the Ganges river. It is a place of pilgrimage and a very holy and peaceful place. The juice stall is a popular travellers’ hangout and is always full. Usually you need to squeeze into a shared booth and it can take 20 minutes to get served but it’s worth the wait. The mango lassi as featured above is full of mangos and has fresh pomegranates on top with shredded coconut $2. They have many fresh fruit and veggie juice combos along with smoothies including some which have avocado. Their other popular menu item is their fruit salad and the one shown above is a replica that I made at home. I usually get the vegan version which comes with muesli, bananas, watermelon, papaya, mangos, pineapple, coconut, pomegranate, soy milk, date syrup and mint $2.80. The date syrup was difficult to find so I decided to make my own. I soaked a cup of dates in warm water for a couple hours. Then I puréed the dates and water in a Vitamix blender. Squeezed out the date pulp and put the liquid into a saucepan and brought to a boil. I cooked the liquid until it thickened, allowed it to cool and poured it over the fruit. It was so heavenly that I ate it everyday for over a week. I’ve been coming to this restaurant since my first visit to Varkala beach in 2010. For India it has exceptional service, the food comes quickly and the people working there are very personable. I tend to eat there at least once a day and the papaya smoothie became my new favorite on this trip. 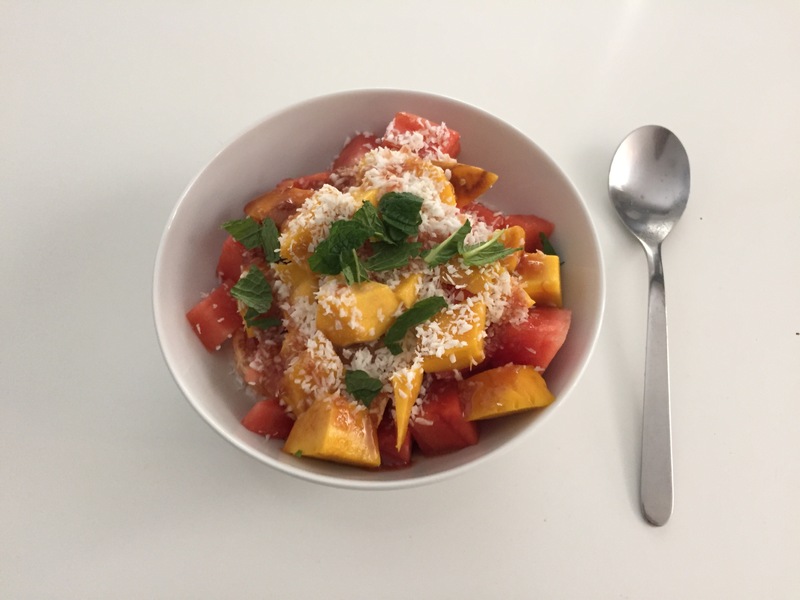 It has papaya, yogurt, lime and ginger ($2). The dinner is also very good and the garlic naan ($1) is delicious. For some reason I did not take many photos off all the food that I ate there but I do have a photo of the veg pakoras ($2). They are fried but not too greasy and come with s small salad. It’s nice to share as a midday snack or as an appetizer. 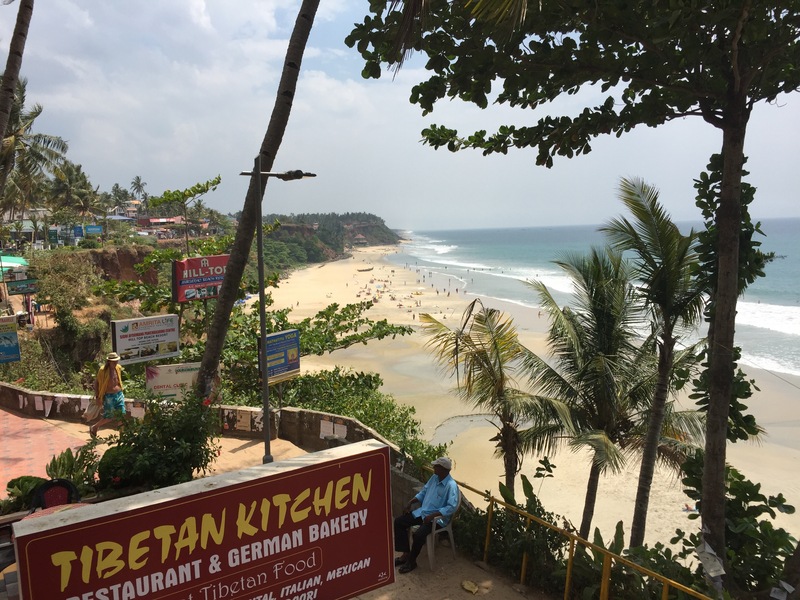 Abba restaurant is located on the south cliff near in Varkala. I am on holiday in south India in the state of Kerala which is known for its beautiful beaches. Varkala beach is situated on a cliff and 3 bodies of water merge there making the sea very tumultuous. At midday it gets unbearably hot and I retreat to the Tibetan Kitchen on the cliff top to rest in the shade where there’s a full breeze. I usually get this Momo soup for lunch as its a light meal. It comes many veggies including carrots, spinach and celery in the soup and the broth is light and simple. 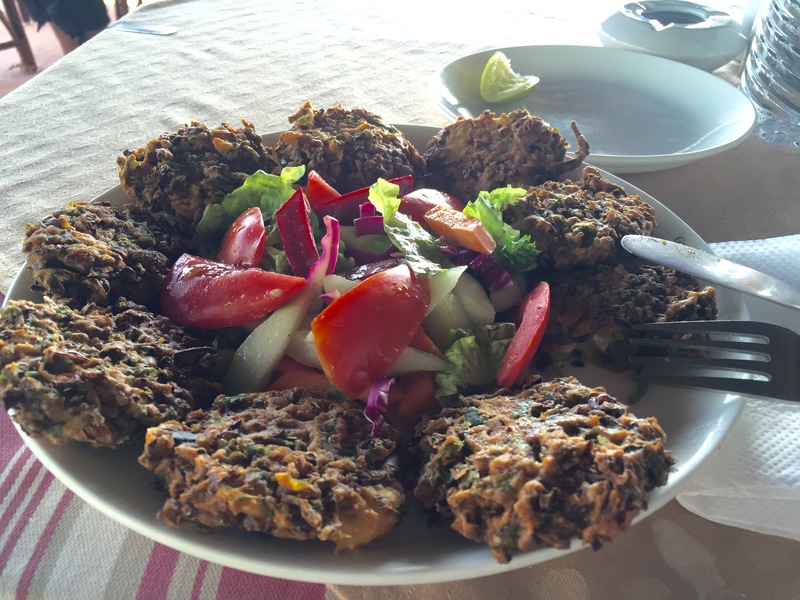 The monos are handmade by the Nepali cooks and have shredded carrots, cabbage, ginger and garlic inside. 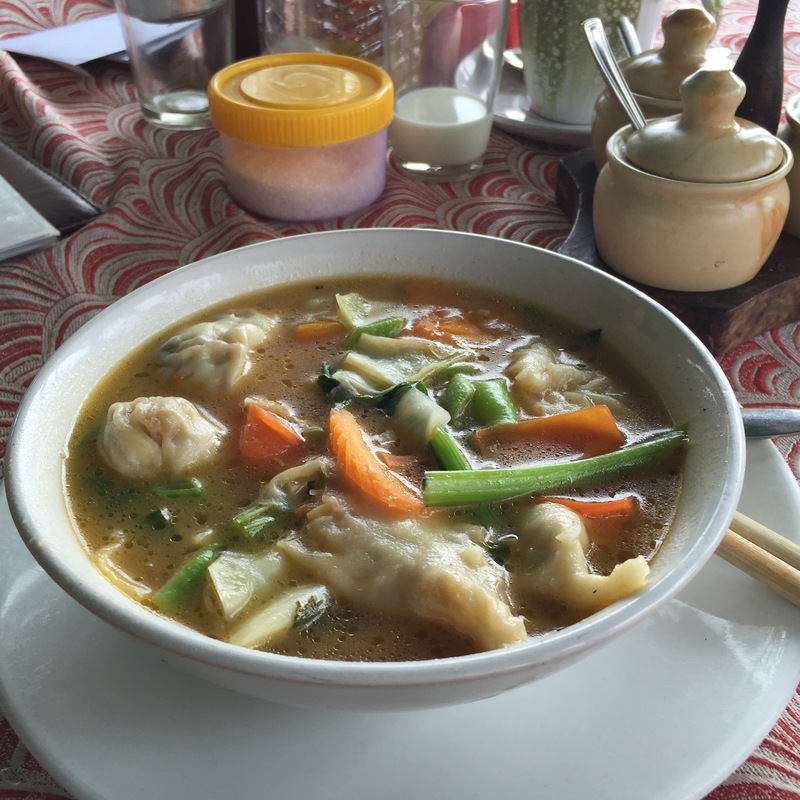 Tibetan food has so much soul which is why I keep going back. 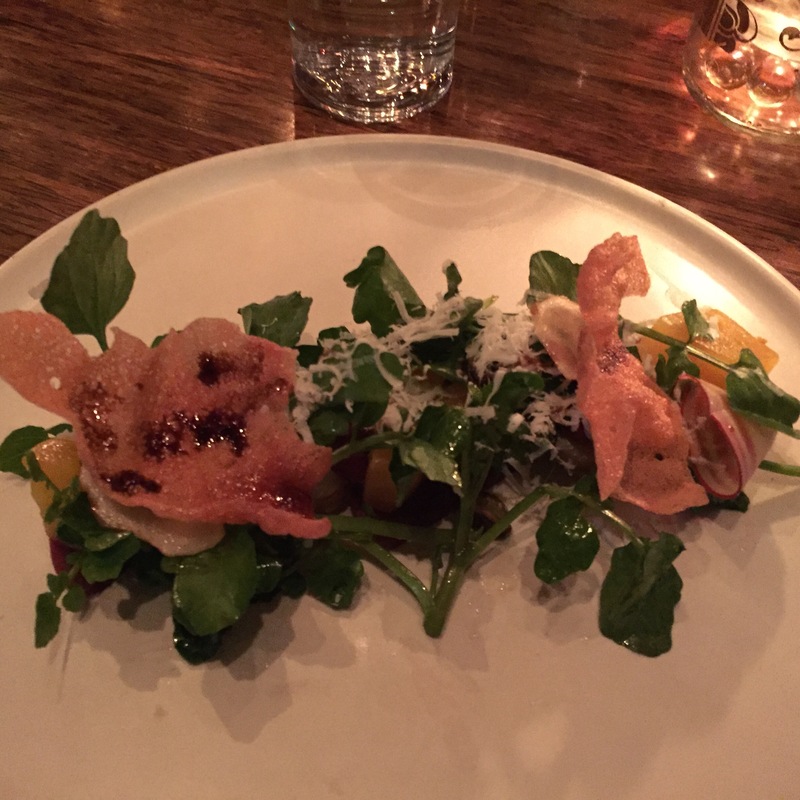 For this year’s annual Dine Out Festival Vancouver, a few friends and I went to Chambar restaurant on 568 Beatty Street. During the festival, restaurants feature 3 course meals for a prefix price and culinary events are showcased around the city. 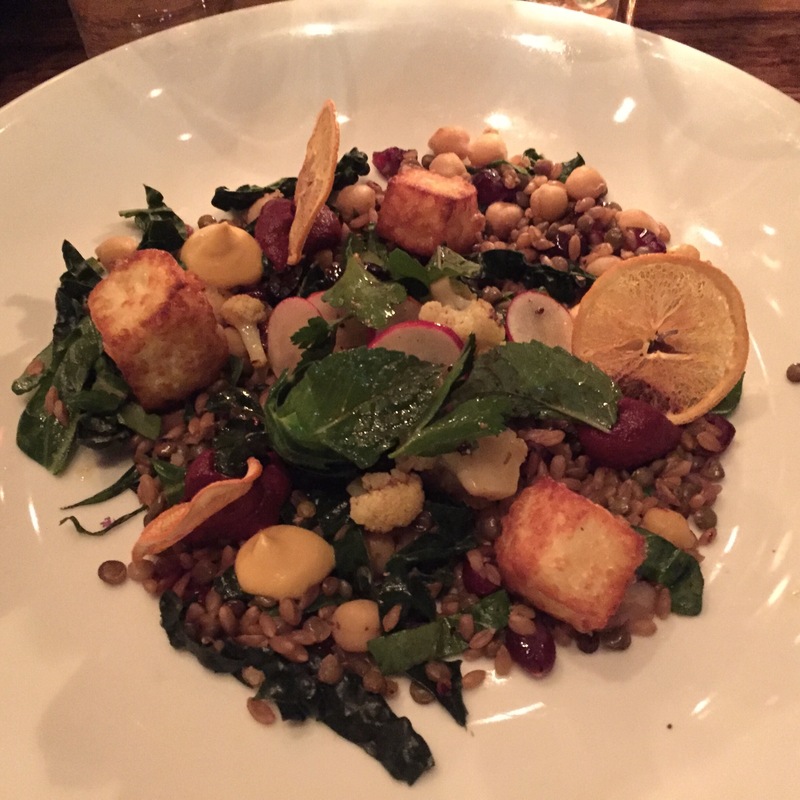 At Chambar, I had the vegetarian option which started with the Salade D’hiver – Roasted Beets, Confit Sunchokes, Feta, Basil & Pistachio Pesto, Lemon Vincotto, Fresh Pomegranate. The ingredients were very fresh and the dressing was light to accent the natural flavours of the ingredients. For the second course I got the L’halloumi -Fried halloumi, ras el hanout, butternut squash & beet hummus, lentils, chickpeas, farro, orange chips, picked herbs. The fried cheese reminded me of the Indian Paneer and the dish was full of a variety of middle eastern flavours. Each bite was unique based on which ingredients and sauces were combined on the fork. For dessert I splurged and got the Mousse Au Chocolat– Belgian chocolate mousse, streusel, malted meringue, dulce de leche ice cream.The mousse had a firm chocolate on the outside and came with the the perfect amount of ice cream. I’m not a big dessert person and was too big for me to finish. The flavours were perfectly balanced but not too sweet. I’ll would definitely order it again. 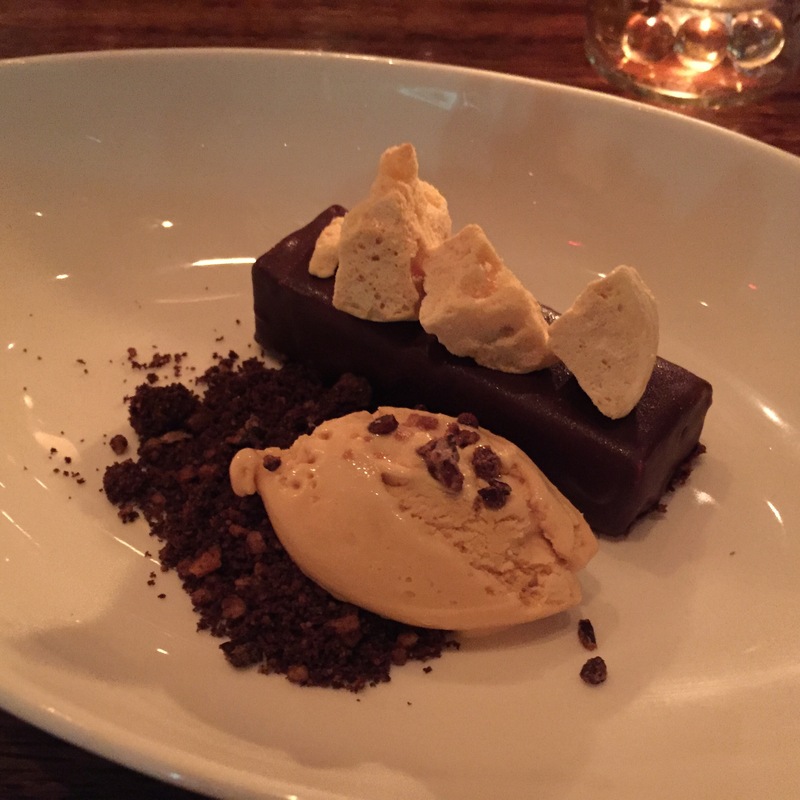 Dine out Vancouver is on until Jan 31, 2016 at Chambar and participating restaurants in Vancouver. This Lebanese restaurant is a favourite of mine and the lunch special comes with a variety of healthy and vegetarian items. I often meet one of my good friends there for lunch as her office is right around the corner from their Kitsilano location. I usually get either the Falafel($12.75) or Najib’s special($13), crispy cauliflower tossed with lemon and sea salt. 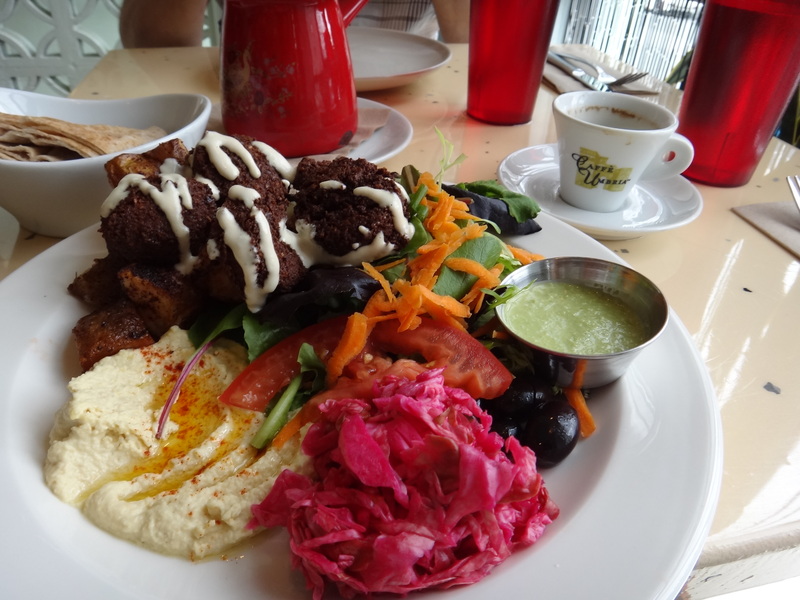 The lunch plate comes with hummus, salad, pickled cabbage, pita, olives and brown rice or potatoes. I get the potatoes and my friend orders half and half. It’s a pretty big plate of food so I time my appetite and go fairly hungry. The service is quick at lunch and it caters to those who work in the area. Sometimes I get a seat a few minutes before my friend arrives and place our order so that we can relax and not feel rushed. The great thing about Nuba is that each of their four locations are designed differently and each one has its own unique personality. People always ask me what my favourite Indian restaurant is. Hands down it’s Vij’s Rangoli because I love, love, love their Portobello Mushroom and Red Bell Pepper Curry on paneer with beet salad & naan ($15.50). The mushroom is cut thick and has a nice chew to it and the paneer is soft and melts in your mouth. Not to mention the perfection of the delicate spices that make the sauce. 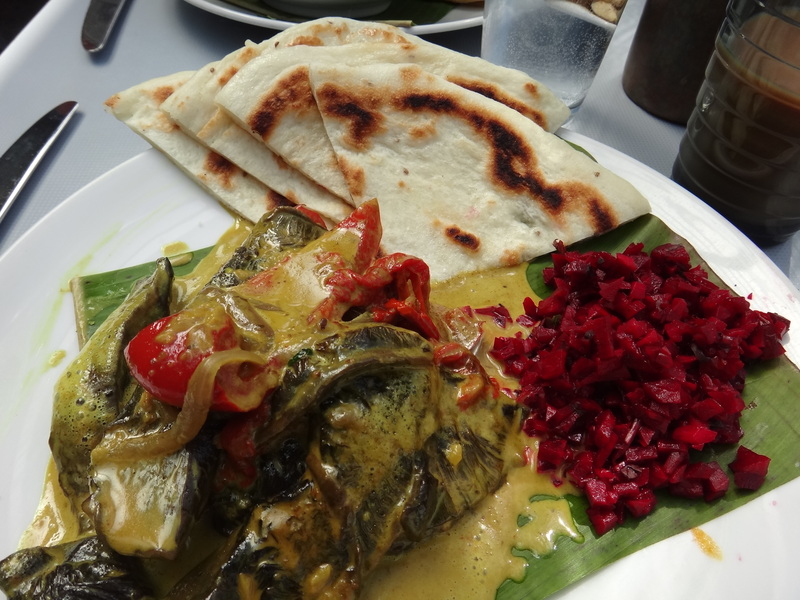 On the complete opposite end of the spectrum, my daughter and I really enjoy Best Quality Restaurant which is more of a traditional Indian restaurant with authentic food and minimal service. This restaurant is pure veg and only serves vegetables and dairy products. The meal that is shown here is the puri with chickpeas ($4.99) and my daughter got the vegetable kofta with rice ($9.99). The place makes you feel like you are transported to India and the prices make you feel the same. The flavours are authentic and the food arrives a few minutes after you order. As the name implies, they use quality ingredients unlike other traditional restaurant and I have never gotten sick or a stomach ache from eating their food. We usually pick up a small box of assorted sweets when we leave which comes to around $5.50 and a box of veggie samosas ($0.75 each). Best Quality is located on Main Street at 57th Avenue in Vancouver. This soup had to be my all time favourite for warming my bones on a cold winter day. 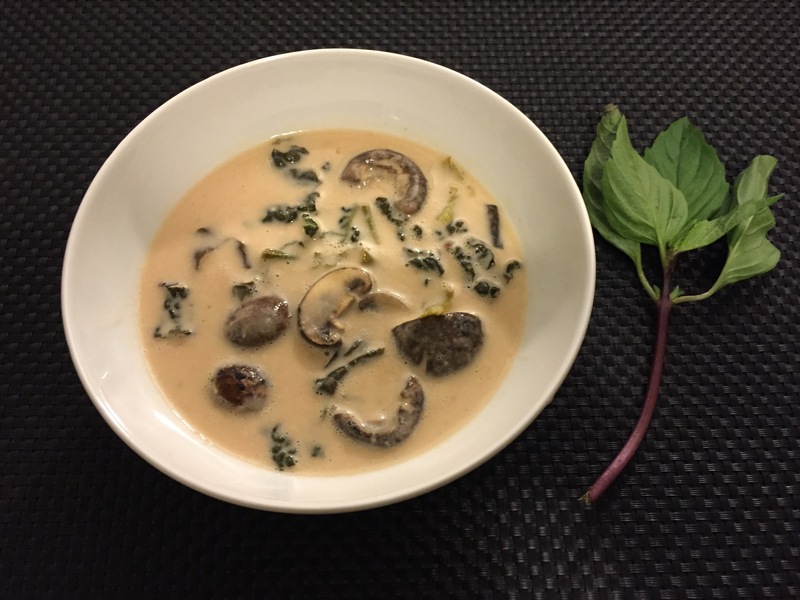 The coconut milk makes it very creamy and the sweet and sour flavour is perfectly balanced on the palate. I like to serve it with cooked quinoa or vermicelli rice noodles to make it into a meal. 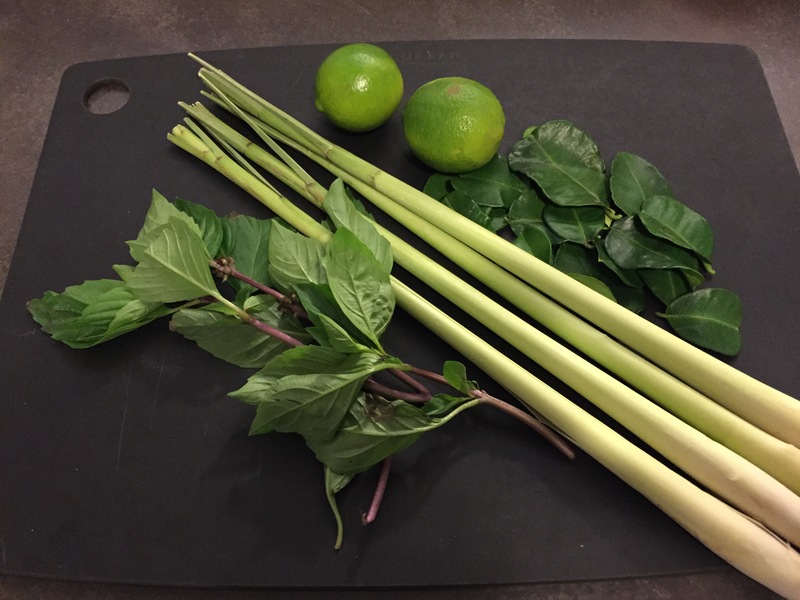 The lemongrass and lime leaves are critical to the flavour, so it’s best to buy them fresh. You can buy them in produce or Asian stores but I go to Granville Island Public Market as the quality is best there. This soup does take some time to make but trust me it’s worth it. 1. Heat 1 Tblsp of oil in a medium stock pot. Sautee the garlic and onions. Add water, lime leaves,lemongrass and simmer for 25 minutes or until fragrant. 2. Add the Bragg, salt, lime juice, siracha, agave and coconut milk. Bring to a boil. 3. Remove the lime leaves and lemongrass. Puree the liquid and set aside. 4. Heat 1 Tblsp oil in the stock pot and the kale. Sautee until wilted. Add the mushrooms and sautee for a minute and add the liquid. Bring to a boil and serve. Garnish with thai basil and cilantro.